As a member of the North Park Little League (NPLL) community, we want you to be fully aware of all of our NPLL events, activities, governance and finances, as well as opportunities for kids, parents, family members, local businesses and members of the community to participate. NPLL is a non-profit entity and all work is performed by volunteers, so we welcome your participation in the NPLL community. Little League International and District 33: Little League provides us the organization, structure and rules, and the local district provides tournaments, training and other resources. The NPLL Board of Directors: The 2015-16 Board has 17 directors elected by the members of NPLL. Anyone can be elected to the board, and anyone can become a voting member of NPLL for a $5 annual fee. The board has three standing committees (Rules & Conduct, Fundraising & Events and Registration & Membership), at least seven officers and managers of functions such as umpires, equipment, fields, safety, communications, etc., and nonmembers are invited to participate in these committees. NPLL Volunteers: NPLL depends on volunteers to manage and coach the 35 teams and 325+ kids in the program, as well as all supporting functions. Other volunteer positions include: Team Parent; Field Maintenance; Player Development; Umpire; Fundraising; Snack Bar managers and workers; as well as members of the board. Sponsors: NPLL depends on sponsors for almost 15% of our income and we value the active role many of the local businesses play in NPLL beyond their financial contribution. Parents & Family Members: The youth sports experience is as much a family experience as it is an exercise in physical, mental and social growth for each child. NPLL appreciates the full participation of families as spectators and volunteers. Players: In the end it is about the kids and our NPLL community never loses sight of that. Other information with your registration/player packets, game schedules, and on our website will have a schedule of events, lists and contacts of all the key officers, sponsors and community members listed above. 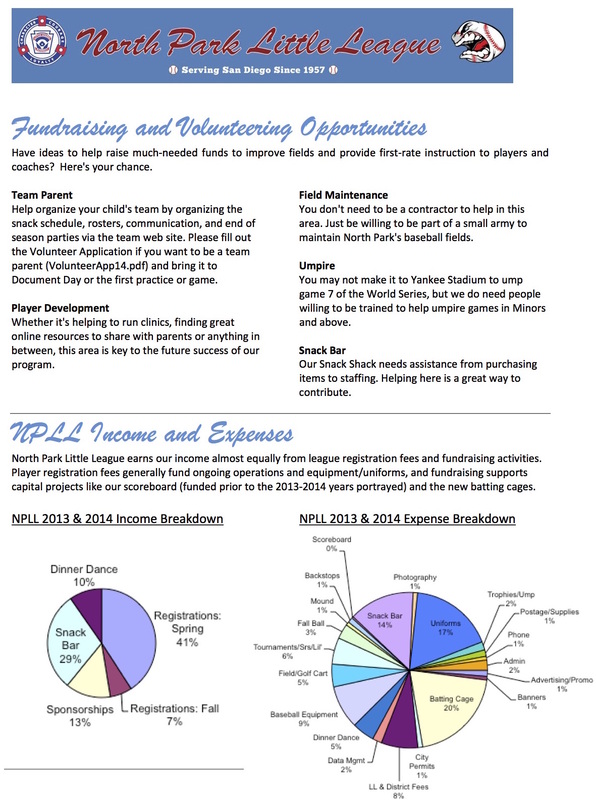 For more information about how NPLL raises funds to improve our fields and provide instruction to our players and coaches, click here for more detailed information about fundraising, income and expenses. Note: Volunteer forms must be submitted in-person at any NPLL event (such as Document Day or Cap Day) or to an adult at the Snack Bar. Go to the Forms page to obtain volunteer forms here.